The Global Drip Irrigation Systems Market is expected to grow at a CAGR of more than 9 % during 2018 to 2023. The market is expected to grow in full force because of the limited supply of water and the efficient use of drip irrigation i.e. consuming less water and delivering appropriate quantity of water at the root zone of each plant. What is Drip Irrigation Systems Market? Drip irrigation systems are used to save water and nutrients by enabling water to drip slowly to the roots of the plants, right from the above of the soil surface or buried below the surface. Majorly, the goal is to take water directly into the root areas and minimize evaporation. These systems distribute the water through a network of pipes, valves, emitters and tubing. Relying up on how well they designed, installed, maintained and operated the system, it can be more effective than other types of irrigation systems. Furthermore, due to the increasing pressure on water conservation, agricultural systems have been emphasizing the need for irrigation systems. Drip irrigation system is a useful technique as it assists in avoiding water wastage and protects against drought conditions. This report incorporates an in-depth assessment of Drip Irrigation Systems Market by Type, Components, Drippers Type, Crop Type, Application and Geography. What are the major applications for Drip Irrigation Systems Market? The various end-users assessed includes Agriculture, Greenhouse, Landscape and others. Agriculture is used more efficiently through drip irrigation systems. Modern irrigation is one of the technological developments in agriculture that has substantial impact on water productivity. These technologies could be one such recent innovation with the ability to use water more effectively in irrigated agriculture. Increasing pressure on industrial facilities makes them to reduce overall costs, boost productivity, quality, and to improve safety. So, they have chosen to automate and to integrate facilities through the management process where water should meet the roots in-order to reduce wastage. Integration with the help of drippers has been prominently utilized to the full extent by electronic controls which are being installed in farms today. There have been advancements in monitoring status which have boosted the practicality and affordability of complete irrigation systems. A producer of plastic pipes, Mexichem had acquired to control Netafim in Israel with an agreement that values the drip irrigation enterprise at $1.895 bn. Main reason for acquisition is that the Netafim holds advanced technologies that can be used as a basis for smart solutions in other industrial fields. So, Mexichem wants to empower the growers to produce higher yields of better-quality crops with less water consumption. It increases water productivity and influences to change the economics of agriculture. 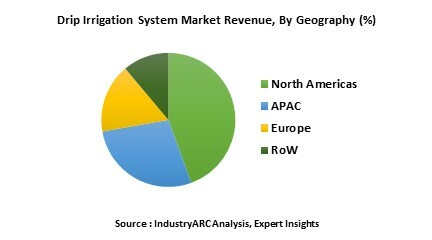 Who are the Major Players in Drip Irrigation Systems market? The companies referred to in the market research report includes NetaFim limited, Jain Irrigation Systems limited, Lindsay Corporation, The Toro Company, Eurodrip S.A Driptech Incorporated, EPC Industries limited, Hunters Industries incorporated, Microjet Irrigation Systems, Nelson Irrigation Corporation and more than 20 companies.